Berhals is a rocky island opposite to Sandakan (Sabah, Malaysia), extending for about 4km from north to south. At its southern end there are high sandstone cliffs, falling straight into the sea in some spots. On its eastern side there are two beaches, a shorter one close to the southern end and a longer one close to the northern end. Both beaches are deserted, i.e. have no tourist infrastructure. 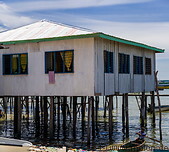 Close to the northern tip, on the western side there is a village consisting of houses and stilt houses inhabited by local Malaysians. The main attraction of Berhala are its cliffs which offer good climbing opportunities (direct start from the ebach is possible). In any case at the moment there is no tourist infrastructure at all on the island and to get there it is necessary to charter a boat from Sandakan. There are also fishermen boats but these only make it to the village on the western side of Berhala.